I’m happy to report that I’m now a Sabian endorsed artist! I’m proud to have joined the ranks of some of my biggest influences and favorite drummers including Billy Kilson, Mark Guilana, and Terreon Gully, and I’m excited to put some new cymbals to the test this fall. I’ve been using Sabian’s 22″ Artisan as my main ride for years now with great results (you can hear it on Hardcoretet’s last two records and on McTuff Vol. 3 here) and recently picked up a pair of 13″ HHX Groove Hats, a 21″ HHX Fierce Ride, and 19″ HHX Fierce Crash. All of these cymbals have rich body and just the right amounts of attack and decay, the perfect qualities for the type of playing I do with McTuff and the many other groups I get to play with. Thanks to the folks at Sabian for making great cymbals and giving me the opportunity to represent them. Happily, with the endorsement comes plenty of chances to put those cymbals to good use. 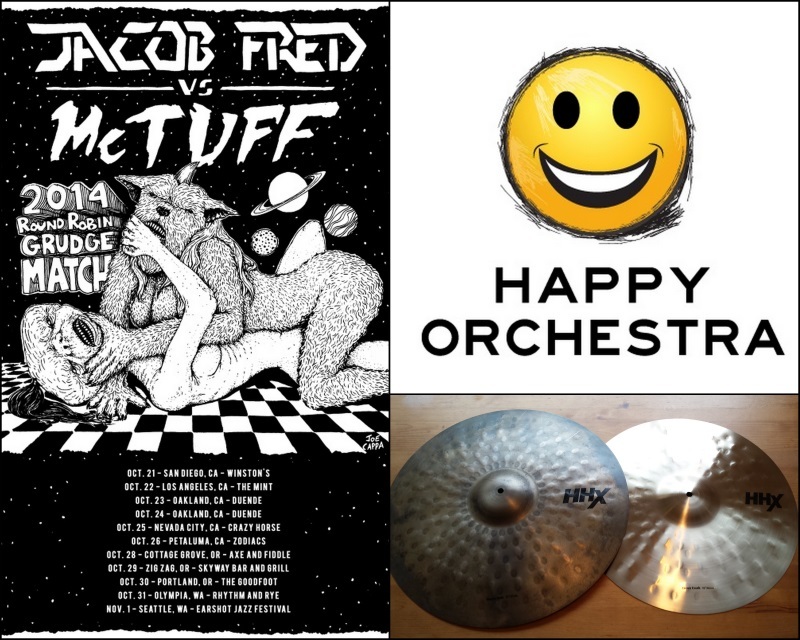 Tomorrow McTuff embarks on a two-week, 12-city west coast tour along with the extremely talented players of Jacob Fred Jazz Odyssey. The band is celebrating its 20th year of making music with a new record and national tour, and McTuff is honored to join on dates from San Diego to Seattle. Check the Performances page to see when we’re in your city, spread the word, and come see a show! Finally, with the members Hardcoretet so busy with their respective projects (Polyrhythmics, Heatwarmer, McTuff, etc) the band is on a bit of a sabbatical. Aside from missing out on making music with those guys, I’m also left without an outlet for writing music of my own. To that end, I’ve started a project called Happy Orchestra that will feature a rotating cast of my favorite musicians and will play a few big shows a year. The inaugural performance will be at Tiborfest at Nectar Lounge on Friday, November 7th and features members of McTuff, Polyrhythmics, and Funky2Death. The bill also includes Richie Aldente, another one of my favorite Seattle groups, and promises to be a ridiculously good time.